Our partner CWS Harrisonburg Refugee Resettlement is working with us to help answer your questions about President Trump's Executive Order. ​The information below was prepared by Refugee Council USA. 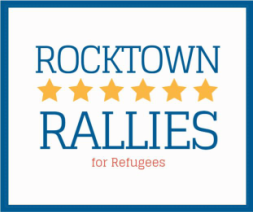 Use your voice - every chance you get - to share that refugees are welcome in our community. Social media, letter, and phone calls are our friends. GET LOUD!!! We know that we are greater as 1! Click below to learn more. President Trump issued an Executive Order that made significant changes to the United States refugee resettlement program.An Executive Order is an order given by the President that is treated as a law in the United States. Because refugee resettlement is controlled by the President in America, he can make changes to the resettlement program. However, an Executive Order cannot violate the Constitution or laws passed by Congress. The order suspends refugee resettlement for the next 120 days, with some exceptions for religious minorities. This means no refugees will be allowed to be resettled in the United States for the next 120 days unless they receive a special exception. It may also stop refugee processing for 120 days. This means overseas interviews and background checks may be delayed. The order suspends all refugees from Syria from coming to the United States. This means no refugees from Syria will be allowed to enter the United States until there is a change to the Executive Order. There is no set time period for this. The order decreases the total number of refugees who can come to the United States in 2017 to 50,000 but still allows for 25,000 more arrivals. We do not know which refugees will be able to enter or when refugees will be allowed to enter the U.S. for resettlement. How will the Executive Order affect me if I am a refugee? If you are already a refugee in the United States, this order will have no effect on your legal status. You still have the same legal status. You can still apply for a Green Card after one year of residence. Some recently arrived refugees may be required to complete additional security screenings. If you are waiting for a family member to be resettled to the United States or to join you through family reunification, it will probably now take them longer to come to the United States. If your family member is from one of the countries that were banned from entering the United States, they will not be allowed to come to the United States until this Executive Order is changed. What if you need legal help? Remember, you are an important part of America. We know you bring valuable contributions to our country. And the majority of Americans do welcome refugees. If you feel safe, share your story. It is important for other Americans to understand and hear the stories of refugees right now. Help others like you. Find this information in your language below and share it with other refugees. If you are not already, and you have been in the United States for enough time, now is the time to become an American citizen. You can take the Refugee Center Online’s free online citizenship preparation course to help you get ready for the citizenship exam. What if you are the victim of discrimination or targeted for a hate crime? ​If you are the victim of a crime, you should immediately call the police: Dial 911.
Who is advocating for refugees? ​In the United States, there is a national group called Refugee Council USA that is working with the Administration to ensure that the proud American tradition of resettling refugees from around the world continues. Many organizations are a part of this group including all of the national Resettlement Agencies. These organizations, along with the majority of Americans, are all standing for refugees. أصدر الرئيس ترامب أمرا تنفيذيا كان له الأثر البالغ على برنامج الولايات المتحدة لإعادة توطين اللاجئين. آقای رئيس جمهور ترامپ فرمان اجرایی صادر کرده‌اند که تغییرات قابل توجهی در طرح اسکان پناهندگان ایالات متحده ایجاد کرده است. فارسیدانلد ترامپ، نخست وزیر جدید ایالات متحده یک فرمان اجرایی جدید را صادر کرده است که تغییرات قابل توجهی را در برنامه استقرار مجدد پناهندگان ایالات متحده ایجاد کرده است. ​​Le Président Trump a publié un décret (Executive Order) qui a beaucoup changé le programme de réinstallation des réfugiés des États-Unis. ​Rais Trump alitoa amri ambayo ilibadilisha sana programu ya ufanyaji upya wa makazi wa wakimbizi. ​سەرۆك ترەمپ فەرمانێکی کارگێڕیی دەرکرد کە گۆڕانکاریی بەرچاوی دروستکرد لە پرۆگرامی داڵدەدانی ئاوارەکان لە ویلایەتە یەکگرتووەکانی ئەمریکادا. Президентом Дональдом Трампом подписан приказ, который вносит существенные изменения в программу США по переселению беженцев. Amerikan Başkanı Trump, ABD mültecilerin yeniden yerleşim programına önemli değişiklikler yapan bir icra (yani üst yönetici) emri çıkardı. ​Tổng thống Trump đã ban hành một sắc luật với nhiều thay đổi quan trọng liên quan đến chương trình tái định cư những người tị nạn ở Hoa Kỳ.